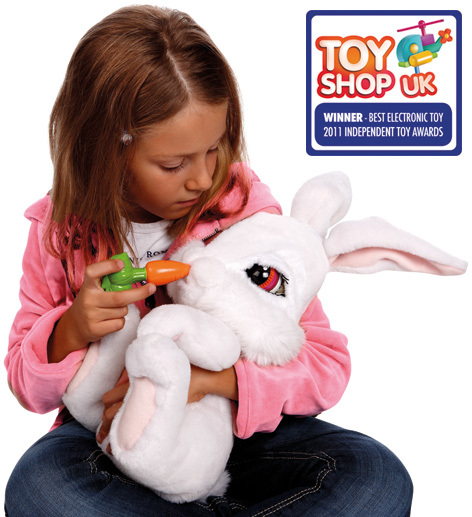 Milky The Bunny won the Best Electronic Toy Category in our Independent Toy Awards. This gorgeous white bunny is a beautiful plush toy in the exciting Emotion Pets range and has wonderfully soft, snow-white fur that makes him so cuddly. Although he has a mind of his own, Milky The Bunny responds to touching and caressing the parts of his body that contain the discreet sensors. For example, when you try and feed him his carrot, he responds by moving his mouth and making chewing sounds. Little girls will fall in love with Milky the Bunny the moment they set eyes upon him - and when they cuddle him he will feel so warm and comfortable that he’ll fall asleep. When he gets excited he can even wiggle his ears and his feet, making him seem almost real! Milky’s interactive features cleverly change during different play times, so his owners will always see a changing character that has a wide range of different responses. Please tell us what you think of Milky The Bunny by Flair.